"Spam Counter-measures" would make a great indie rock album name. The site is undergoing a significant upgrade. Many bugs have been fixed and performance and usability should improve significantly, both on desktop and mobile. There will also be some new features. As well, Kephryn and I have worked to streamline the server load, database backups, and upgrade process. Future improvements will be closer to seamless, and stability in general will increase. However, the job is not quite finished yet. The goal is to have everything complete before the season starts, possibly as early as the end of the day (October 2nd). Until then, there are some glitches - forums will not properly mark as read, Tapatalk is currently broken, and messaging is reverted to the default system. There may be a few other kinks to iron out as well. Please report any bugs you encounter. The full upgrade script has not yet been run, as the entire server operating system is undergoing a major upgrade before it can be completed. Once that is done, there will be a short down time and then the bugs should all be squashed and performance will be drastically superior to what it's ever been. When it's all finished, I will list the new changes. Thanks Matt :) Do you find the site is running slower than normal today? Avatar uploads from mobile devices now respect image orientation properly. Dates and times now properly reflect a user’s customized settings. General performance has been significantly improved. Menus now behave properly on iOS. Mobile and Tapatalk responsiveness in general has been significantly improved. The Join Date and Posts columns of the Member List now sort properly when clicked. A few new basic styles have been added. Each post can now be shared to Facebook or Twitter through a simple click or tap. The "Like" button has returned. Members can like each other's posts. Depending on your notification settings, you may receive a notification when another member has liked one of your posts. Imagine that you've logged in but forgot to check the “Remember Me” button. You find an interesting topic and type a long reply. When you're finished, you submit the post and get an error that says you don't have permission to perform that action. What happened is your session timed out while typing. To resolve this, Inline Log In has been added. Now instead of receiving a confusing message, you will receive a dialog box simply asking for your password in order to properly process the new post. Members can now create Events when starting a new post. As an example of this, I created an event for the 2019 Winter Classic. It creates a thread and a post like normal, but also adds the event to the new Calendar system. Please see attached photos for examples. The URLs of threads now end in a “node number” instead of the full title. So, for example, forum.highonhockey.com/forum/nhl-eastern-conference/atlantic-division/ottawa-senators/29988-ottawa-appoints-troy-mann-as-head-coach-of-the-ahl-s-belleville-senators becomes forum.highonhockey.com/node/29988. One of the reasons for this change is to make threads friendlier for sharing to social media. vBulletin Messenger is back. Private messages are now more accessible and can be accessed via the drop down menu at the top of the site, beside your username. Participants can be added to ongoing message threads by the conversation organizer. 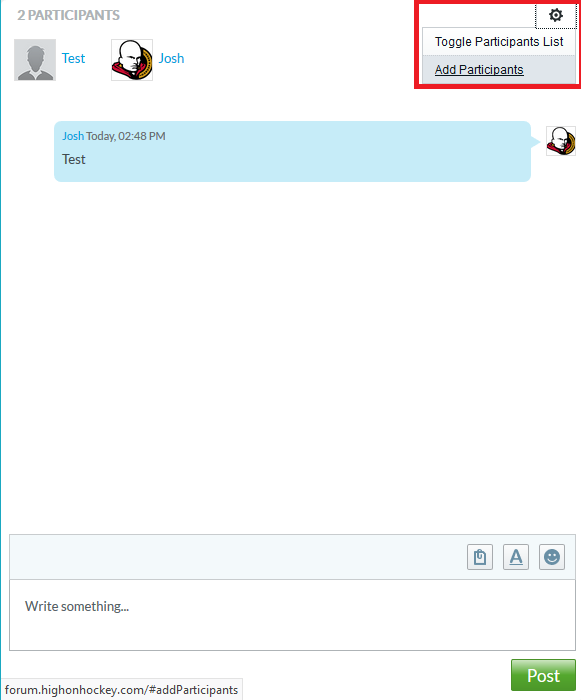 To do this, from within a conversation window, click on the settings icon at the top right and then “Add Participants”. You can also send another member a message by clicking on the chat bubble icon beside their username in a forum thread. Please see attached photos for examples. High on Hockey will be 5 years old in September. Half a decade! Already we’ve surpassed 1,750 topics and 20,000 posts! Brandon recently surpassed 4,000 posts, Jasmine is closing in on 3,000, Mike will soon reach 2,500, Matt will soon reach 2,000, and Owen is closing in on 1,500! In addition to the above improvements, I also pruned all of the accounts that had been created by spambots. The forum statistics now correctly reflect activity. I also added a new module called "Member Stats". You can find the new module on the main page, in the left column, under High on Hockey Statistics. For now, it displays the top-five posters and the most recent five members. All errors uploading avatars and images have been fixed! I added social sharing buttons to the top of each thread. In the image below, the part in red has been added. Alright guys. We can FINALLY properly embed both tweets and YouTube videos! It's a very similar process for YouTube videos. Enter the unique video ID (everything after "watch?v=") between youtube and /youtube tags.